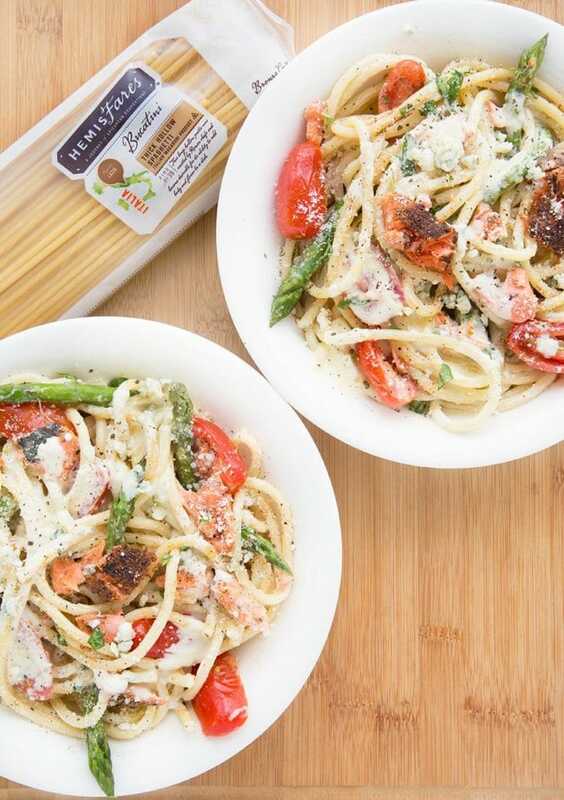 When you're thinking pasta for dinner, think about my easy to make and oh so delicious Bucatini with blackened salmon, asparagus, tomatoes and a light gorgonzola cream sauce! 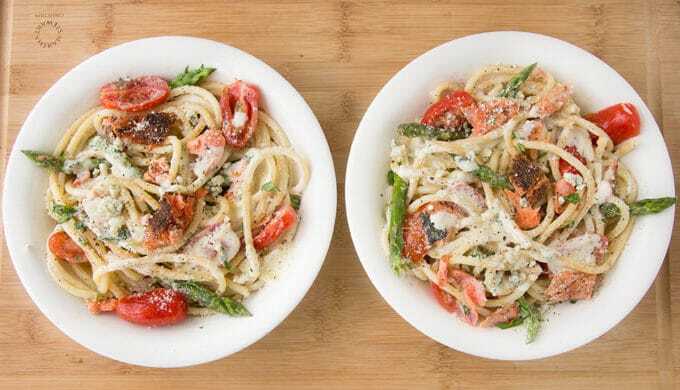 Take a Trip to Italy with my Bucatini and Blackened Salmon. Have you ever wondered how sad life would be without pasta? It’s almost heartbreaking to think about it…sigh. For this dish I choose Bucatini. Bucatini is a slow-dried, thick and hollow pasta that is from the Lazio Region of Italy and is a favorite pasta of Rome. 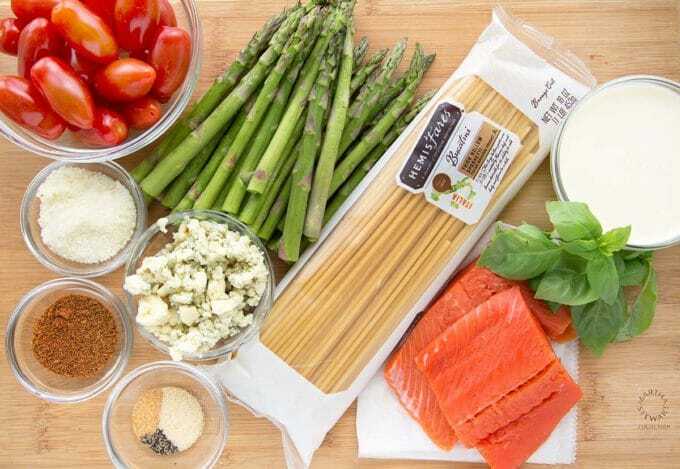 Today we are making Bucatini with Blackened Salmon, Asparagus and Grape Tomatoes in a Gorgonzola Cream Sauce. Let’s begin by gathering our ingredients aka Mise en Place. Although the dish looks complicated it only has a few components you need to get ready. 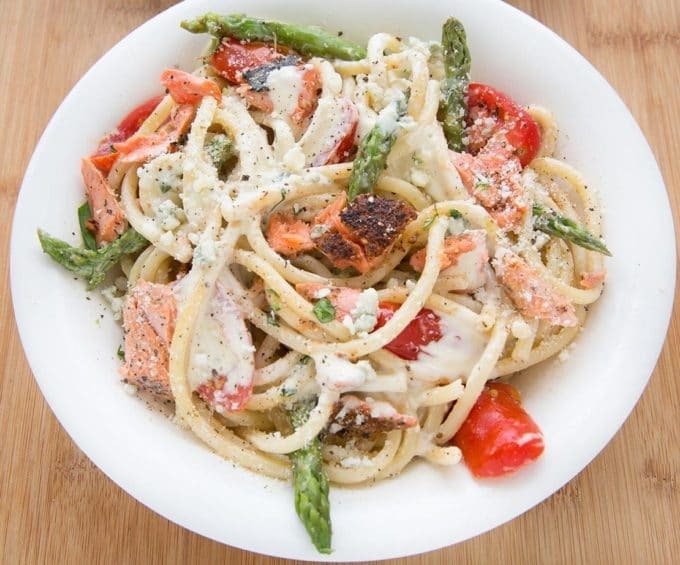 Lightly cook the asparagus, start the cream sauce reduction, blacken the salmon and cook the pasta. If you have a nice serving bowl it makes a great presentation. If not, you can serve out the portions in your pasta bowls or dinner plates. Serve up your pasta with extra Romano and Gorgonzola Cheese and fresh ground black pepper. Can I tell you that is dish was ah-mazingly delicious? In fact, even reheated the second day it was still better than most of the pasta dishes you’ll order at your favorite Italian restaurant. And at a fraction of the price! 1.5 cups asparagus spear tips and 2 inches below. About 4 inches in total. Place the asparagus in saute pan and cover with water. Bring the water to a boil and allow to boil for one minute. Drain and cool asparagus spears. Cut spears in half and keep on the side until needed. In a saute pan add cream and chicken stock and allow to reduce over medium heat for approximately 5 minutes. Add Gorgonzola, Romano cheese and spices and reduce heat to low and allow mix well with a wire whip. As the sauce begins to thicken move the pan off the heat. coat top side of salmon in blackening seasonings. place into heated cast iron skillet very lightly oiled saute pan. Cook on each side for 2 minutes. Make sure the fan is on over the stove!! **Alternate method: Salmon can be cooked in 400-degree oven for 12 minutes. After coating the salmon lightly spray using a vegetable pan spray. This is only needed for the oven method. Place salmon to the side until needed. Add grape tomato halves and asparagus into sauce and bring sauce back to a boil. 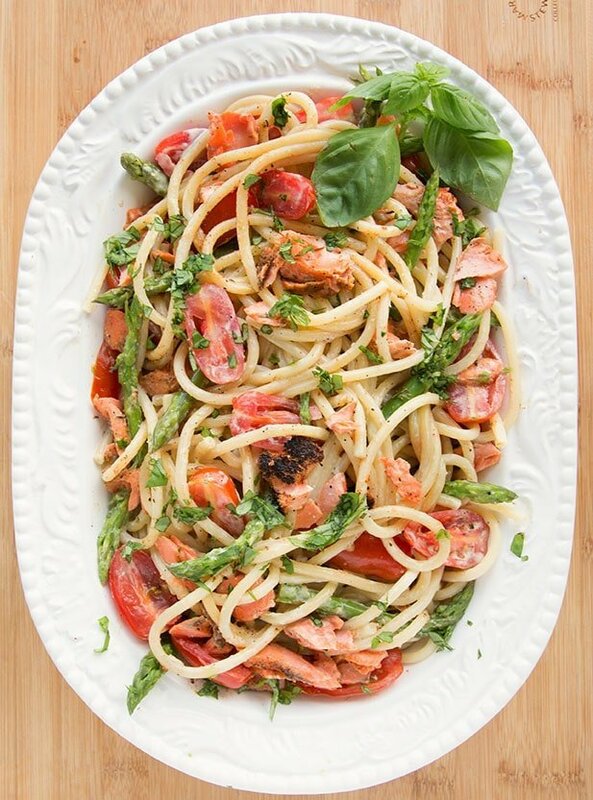 Break salmon by hand into small pieces and carefully add into the prepared pasta. Garnish with chopped basil and serve. Have fresh ground black pepper, Romano and Gorgonzola cheese to add to the pasta. This was amazing and far surpassed what we can get sometimes in fancy Italian restaurants. I made half the recipe since there are two of us. I bought fresh Sockeye salmon at Publix, and I cooked it medium rare in my cast iron pan on the grill. (Don’t be shy on the blackened seasoning). I also made fresh pappardelle pasta, which was amazing. Truly a great meal with no changes! Thank you so much for such a great review and comment Cheri! 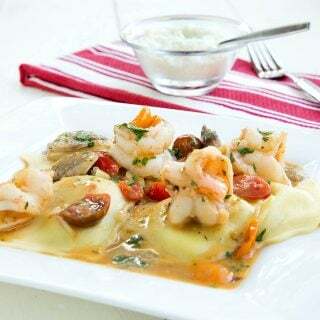 I know exactly what you mean about this dish, every now and then one really surprises me with how delicious it is, this is one of those dishes! Love salmon! I never thought to add gorgonzola to it! This really intrigues me I love gorgonzola as well!! Yummy! Thank you Deanna, it truly was delicious! 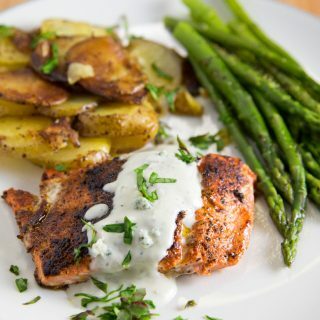 So how do you blacken your salmon? 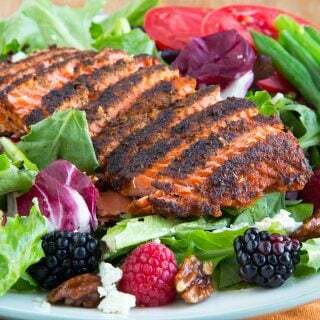 I am just curious because I love salmon but there is a really fine line between blackened and overcooked. And I hate dried out salmon. But as a complete dish this does look amazing. It’s in the instructions of the recipe David, and I used a cast iron skillet. I did make my salmon a little undercooked which worked out really well in the dish. I hope you get a chance to try it. This is such a fancy looking dish, Chef! Love anything pasta, especially if there is some cheese involved! Looks great, Cheffie! You had me at “bucatini” 😀 Will definitely try sometime soon! Thanks Mia, It really was OMG delicious! 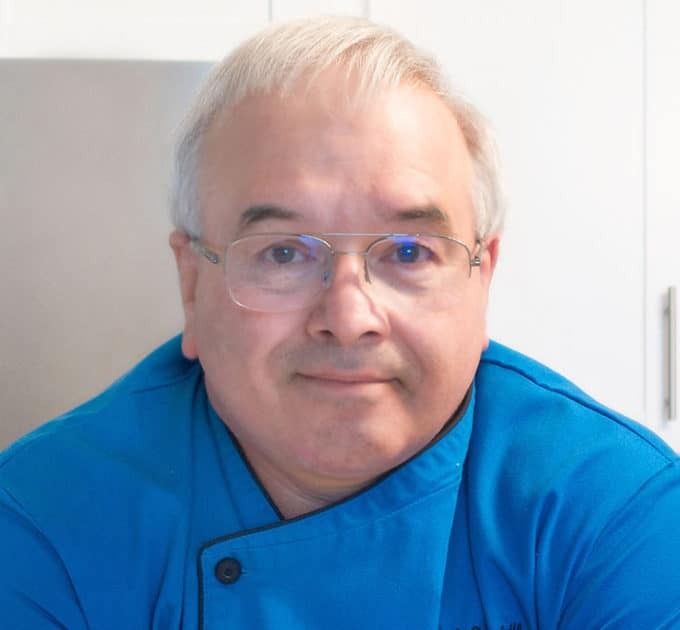 Hi Chef, I must disagree with you when it comes to salmon. My wife is related to one of the fish markets on the East Coast and they recommend & we have ordered/eaten numerous times FAROE ISLANDS SALMON. We love it above all others. 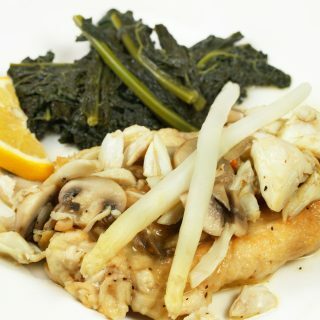 Your recipes are the best on the web!! not a problem Jimmy, everyone gets to eat what they like best! Thanks for using my recipes! 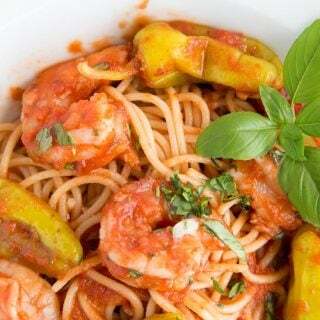 A life without pasta would just be a sad, sad life! 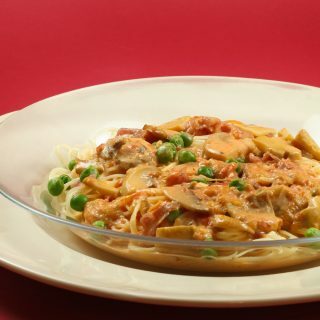 We have pasta at least once a month! This looks wonderful! thanks Angie, I completely agree! This looks amazing! Anything with gorgonzola has my vote! Thanks! That looks delicious. I am preparing for this BUCATINI. Thank you Isabella, I hope you enjoy it as much as I did! This looks awesome chef and a must try. It really was delicious Larry! My wife was away and I ate it all over two days.